...Please let me know of any corrections or other issues. Results will be submitted shortly, and become final, pending RUSA certification. Temperatures at the start were in the low 20F's but managed to briefly make it into the low 40F's by mid afternoon. The skies were mostly cloudy all day and there were some snow flurries on the northern extent of the course. However the sun did manage to peek out a couple of times during the mid afternoon hours. 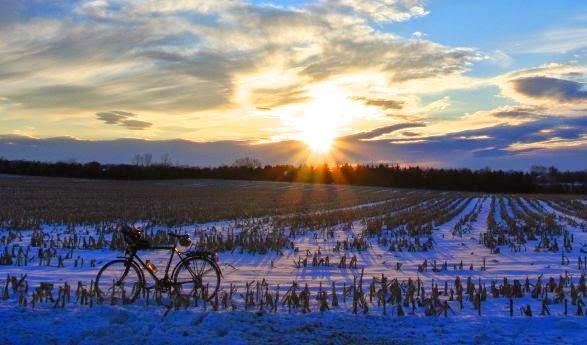 With plenty of snow still on the ground from last week's storm, it certainly was a winter day's ride. But we were very lucky to squeeze this one in without any postponements or cancellations given the recent weather pattern of weekly storms arriving like clockwork followed by a deep freeze. With the limited number of days that have been safe for riding, it was surprising to see 25 registered riders looking to ride 200k on a cold winter day -- about twice the number of riders last Februrary. Perhaps this was a sign of pent-up cabin fever after weeks of indoor training. 22 riders took the start and 21 finished. Of note, CJ A. completed an Eastern PA R-12 series, and joins the Eastern PA Honor roll. The Eastern PA R-12 is still a very select distinction, with only 8 other riders who have accomplished this feat. With the cancellation of Janurary's Beyond Hope to New Hope 200k brevet, riders were able to keep their Eastern PA R-12 streak going thanks to organizer Bill O., who agreed to run the event as a permanent in January. Also of note, Eric Q. completed his very first brevet. Congratulations Eric; one down, and just 11 more to go for your own R12 streak! CJ writes: "...I started last March. Little did I know back then that I would come back the next month, and the next month, and the next month....The ride yesterday was a roller-coaster for me. Freezing and hungry while it's snowing, feeling better heading south, over-eating and stomach problems the second half of the day, and the cherry on top: a slow leak 6 miles out from Milford while coming back up 29. But, the knowledge that I would make it to the finish trumped all worries. Thanks to Zach and Keith, as they proved once again to be great riding partners and 'wingmen'. Most of the day, on the busy roads, we didn't get much chance to ride side-by-side and chat, but the stretch from Runyon Mill to 607 was a wonderful and refreshing change. Makes me miss the rural farm roads back in Chester County. And, of course, I can't go without mentioning the greatest controle ever, Brick Farm Market! Thanks to Jon for the send-off, and to him and Guy for awaiting our safe return. And special thanks to Gilbert for sticking around at the finish to celebrate the end of a long and arduous journey...."
Larry M from Syracuse, NY also completed an R-12, which is quite an accomplishment with the challenging winter conditions where he lives. Larry writes: "...Often wondered what was beyond Bloomsbury, NJ on Rt. 173 in the other direction, and wow, what a nice surprise. The climb up Tunnel Road and the subsequent ridge hopping into Hopewell, NJ was a nice variation. And thanks for helping me earn my second R-12 RUSA Award as completion of your 200K on Saturday helped me achieve that. Nice gathering of riders for a quick meal at the Ship Inn concluded a great day on the road! See you all again sometime in 2015!..." Keith S.. writes: "... Hats off to the volunteers who supported the Hopewell 200k! Thank you for a warm welcome and send off for a day of riding that saw a lot of weather change. From the snow showers and drop in temps that greeted us to the north, to the peak-a-boo cloud / sun that warmed us to the south - what a ride! I even had the opportunity to change into my fingerless summer gloves for a short time. The glove change didn't last too long, but neither did the 38 degree temps that were forecasted. If I recall, the warmest temps came around 3:30 or so - nice for February. Anyway, I had a great ride and conversation with CJ and Zach, thanks! Note: CJ finished his R-12 nursing a flat for the final miles into Milford. Congrats my friend ..."
Peter M. writes: "...Thanks for setting up a great course today. It was nice to be out for a long ride ..."
Thanks to Jon, Guy and you..."
This concludes the Eastern PA 2015 winter schedule -- whew! It certainly has been a rough stretch of months, going all the way back to the November 200k. I for one, am looking forward to the spring brevets which will kick off on March 21st with a 200k out of Milford. And after that, the PA Fleche is on the weekend of April 11th: now would be a good time to be getting your teams and route together. Organizer Jon Clamp will be meeting you at the start to send you on your way, and he'll be joined by volunteer Guy Harris to greet you at the finish. The start is at the Milford Bakery, but you should park your car in the big parking lot on Church St -- there is a sign indicating private parking, but PA Randonneurs has secured permission from the owner, US Health (which will be closed). The Bakery will be open by 6AM and in addition to baked items, breakfast sandwich are made to order. The finish controle is at the Blairstown Inn just a couple of stores away from the Bakery. Reminder: With the limited daylight, lights and reflective gear will be checked at the start. Guy Harris checked out the course on Friday morning and reports: "... I drove the section of the course from Rt173/Tunnel Rd to Rileyville Rd./518 today. Right side of the fog line is mostly ice and snow so not usable. **In general** the road is clear of ice to the left of fog line and to dry pavement. There is however the occasional melt water / ice at driveways, mailboxes, and shaded areas which can provide a few icy spots to the left of the fog line. Tunnel Rd. and the detour are fine. I suspect that this will be the worst section of ride. Generally 519 is plowed better but I haven't seen it. I am sure Rt29 coming up the river will be great - it always is..."
On Thursday afternoon, I checked out the course between Hopewell and Rieglesville, and found that the roads were generally clear of ice and snow as well. A volunteer preride was completed this past Sunday by Jon Clamp and Guy Harris. The cuesheet has been updated to draft 2, dated 2/2, for a detour around a closed bridge at mile 88. Guy reports : "...The fixies kept us pretty warm all day! South Hunterdon HS sign even showed 35 degrees! The only snow was just a few flurries coming up Rt29. Certainly warmer than the forecast for next Saturday. Bridge on Wertsville is definitely out - gone. Detour is right at road closed barricade onto Runyon Mill Rd, about 0.5mile to left on Saddle Shop Road, about 1mile to Rileyville Rd./607, then right and back on course. The detour is really just the other two sides of the rectangle. Roads were in pretty good shape overall. The right side of the road on the descent into Hopewell on Rileyville Rd was a little chewed up. Leaving Hopewell on 518 about 0.3mile past the BR at mile 94.7 there is a somewhat bad angle RR track crossing. Probably worth noting although there are many worse ones on our rides. The crossing itself is good but the groove seems a bit wider and deeper than normal. Fortunately most people will be going slower here anyway since it is on the climb out of Hopewell. The Brick Farm Market is a nice control. Great food, warm place to sit. A welcome stop after the climbs over the ridges from Bloomsbury ..."
Jon adds: "... the only thing I would add is that a good deal of the shoulders are littered with winter debris of salt and gravel so end up being a little rougher than normal. There are also the usual pot holes that Winter provides so a keen eye should kept for these..."
As usual, drop me a note by Thursday afternoon, if you'd like to added to the roster. And be sure to monitor the website and this message board for any last minute updates or postponements.